Captain Jon Armstrong and Corporal Arjun Limbu have set off on the first leg of their epic 100-day circumnavigation of Ellesmere Island. The fearless pair arrived at Grise Fiord courtesy of the Canadian Airforce who had shipped them and their equipment from Resolute to the Island’s largest settlement on its southernmost coast. From Grise Fiord the duo hope to reach the Alert weather station, where they will pick up their kayaks, in around 40 days time by walking through treacherous icy conditions. 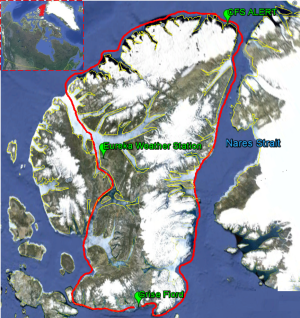 We will follow their progress with Google Map posts as they take a clockwise route reaching the hazardous Nares Straits when the Arctic temperatures are at their highest, hopefully ensuring a safer passage through the Straits. At this point the journey can slow to the team being able to cover just one mile a day. The 1500 mile distance will be covered primarily by kayak but with varied terrain and unpredictable climactic conditions, the team also will be required to ski, and climb, dragging fully loaded kayaks behind them in an attempt to complete a challenge which only 1 team has successfully completed before. Ellesmere Island is located in the remote Canadian Arctic. It is the world’s 10th largest island and has a population of just 147 people, it is one of the last stretches of land before the North Pole and its coastline is continually changing with shifts in climate and environmental conditions.